The common name aptly describes Chorizema cordatum, heart shaped foliage and bright red pea like flowers. In full flower, this is a very colourful, even spectacular plant. It originates from the southern areas of WA and is found in wetter areas than may other species. This natural habitat makes the plant one of the easier ones to grow in the eastern states. Typical of the Western Australia peas flowers, this is a species that like plenty of sun, however light or dappled shade in the afternoon is best, good drainage and low humidity. 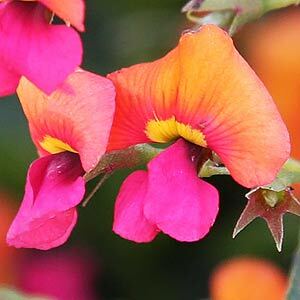 The fact that Chorizema cordatum grows well in light shade, and has such colourful flowers makes it useful in brightening up somewhat dull areas in late winter through to early spring. Being a somewhat straggly plant, it is best planted close to other slightly more upright growers, it will use these for support. This method of growing ensures that the flowers are shown off to best effect. Flowering from early winter right through early summer the flowers are a two toned affair, two orange to red petals and the others being a lipstick pink to red. The flowers are large and make an impact when in full bloom. This is a species that does like some water, however they key to successful growing conditions is good drainage. It is not a plant that tolerates wet or waterlogged soils. Although it grows well in full sun, it will perform a little better in a little shade, and does prefer the soil to be mulched. The best time to plant Chorizema cordatum is in late summer as the weather cools down. This gives the plant a chance to develop a good root system before the heat of the next summer. Although heavy pruning is not recommended, tip pruning is advisable. This tip pruning is best carried out immediately after flowering. A slow release native plant fertiliser in spring will be beneficial.